i’m not going to lie. my job can be a bit boring. now don’t get me wrong i love the type of work that i do (i am just good at sorting/organizing/dealing with paperwork). give me a stack of paper over an annoying person any day! but back to my boring job. it can be mundane…same routine for almost 13 years…sorting, scanning, filing, stamping, copying – you get the point – i am not claiming i don’t ever make a mistake but i can do my job almost on auto pilot. kind of like getting to work after a long night. you park the car and as you are walking to the door you think: i am already here i hope i didn’t run any read lights because i don’t remember my drive at all! a lot of days i leave and think well i guess that is over. needless to say i have a lot of time to reflect on things and allow my imagination to go wild (especially when i am scanning – boo). anyways over the past few days i have had a ton of time to reflect on things, people, events, dreams, hopes everything…. in high school i wouldn’t say that i was popular by any standard but i hung with the popular people. i knew who to sit with and who to accept party invitations from and who to avoid. i had friends in high school from all over the popularity spectrum. as our reunion gets closer it makes me realize that a lot of my friends weren’t really friends at all, but bodies that were meant to interact with me during a fantastic time of my life (fantastic should be read with disdain and sarcasm). i see these people on facebook and sometimes out in public and it makes me want to gag. they have the fake “omgitissogoodtoseeyouhopeyouarewellloveyou” attitude as they run the other way. (i will pause to admit i usually will duck down another aisle if i see someone i don’t want to talk to). it kills me that people are still so fake to me. it isn’t like i am saying i have never been fake with some of these people, but i know that i am who i am and if you don’t like that it is ok. i don’t have to impress you so that i can eat lunch with you anymore. i am an adult and i can sit alone dang it! as the reunion draws near i have been asked if i am going to go…i thought about it (about as long as it took me to blink) and said no. i don’t need to be in a room of people that i know now as only status updates and act like we are still close like we were. yes i still talk to people from high school and yes i still see people from high school and yes i still am friends with people from high school…but i don’t need a reunion to see them and hug them and catch up on what their last status was or where their latest mobile upload was from…i simply call them or text them and say hey dinner soon? and we do. so as i sit here and scan and think…happy 10 years to being out of high school and cheers to the relationships that have gotten stronger with years. this past weekend we took the youth to the beach…cherry grove to be exact. it was andy and myself and 11 kids. this trip is always fun yet stressful to me. i am always worried that we will lose a kid – to the waves, strangers, just getting lost, dying of sun poison, food poisoning, you name it- i have thought of it. it is also a fun trip because it is the beach. who doesn’t love the beach? (ok i know a lot of people are like well i like the beach and don’t love it but that it is besides the point). it is a special trip because i have been going on this trip for years and not just as an advisor but as a kid. in the church we grew up in our youth leaders would take us to the beach and we stayed at a place called the karen maria (good ole karen) and it was a 4 unit apartment a block or so off the beach. in the late 90’s and 2000’s it was stuck in the 70’s but it was cheap and for the weekend it was home. karen saw many secrets and keeps them to herself and i relive mine each time i see the front of the place. when we told our youth we were going to the beach 4 years ago (hard to believe that this was our 4th beach trip with BPC) but they were so excited. we drove up and they stared at our beach home with disgust. i couldn’t believe they weren’t ecstatic to be staying in a place that i loved…we sent the kids inside and they looked around and made comments like it stinks, look at the decorations, yuck look at that…i laughed – those where the same comments i made years ago about the same place…good ole karen still cheap and the best place for youth beach trips. in reality it doesn’t smell great and the decor hasn’t changed AT ALL but it still functions as a great place to stay for a weekend. since this was our 4th trip a lot of the kids knew what to expect and weren’t shocked at the decor. they knew how far they were allowed to travel without adult supervision…one of the perks for where we stay is that there is a grocery store and a few other stores right down the road (walking distance) and we feel safe enough letting the kids venture away. the theme for the weekend was prison break and we had a great time talking about being Christian in a world that isn’t fully Christian. we talked about the influences at school and around us, even at home. we talked about rules and breaking rules. my sweet loving husband comes up with games for the kids to play…some are fun with no point and then some are fun with a point so we played a game to illustrate sin. it consisted of sharpies and weird rules (like if you ask a question you have to turn your head and close your eyes, or if you walk through a door you have to go backwards) if you break a rule you get a black mark on your arm. at the end of the day we talked about how hard it was to follow the rules even though we know what the rules are. we talked about hiding our marks when we went in public. we talked about explaining what the marks were and that it was a sign that we broke rules. at the end we compared the marks to sin. it was a great comparison and visual that the kids looked at. we talked about letting others slip when they let us slip and we talked a lot about all different aspects with that game. as always it is sad to leave the beach…when we left it was raining…i think God was crying because he wanted me to stay…just saying. but anyways we had a great weekend with a great group of kids and karen survived one more trip. my bad….it has been a while. so much to catch up on. i haven’t made any comments about my new years resolution in a while and wanted to report that i still haven’t bitten my nails…why does this matter you might be asking? we packed our bags and ran through the list of things we had to have (wallet – andy forgot it once…long story, passports, clothes, camera, directions). we checked each thing off the list and put the bags in the car. 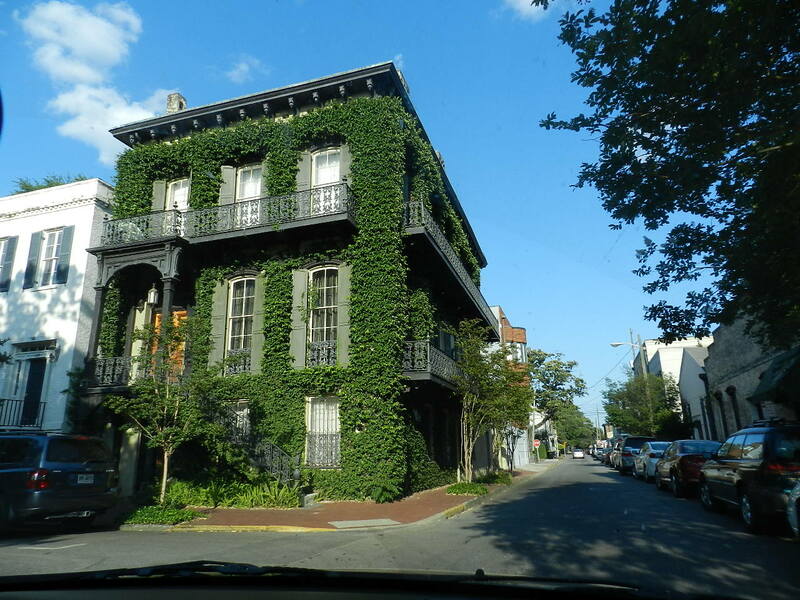 we had great ambitions to leave at 7 saturday morning so we could make it to savannah by lunch time and walk around and eat. (we had to put the luggage in the car friday night so otis didn’t have a fit). this might be a good time to state that i have a little ocd (shocker as if you didn’t know from previous posts) but i had to make sure the house was clean (for the people staying with otis – mom, dad, and kendra – for when we got home i didn’t want to clean after a week away – and as morbid as it is incase anything happens to us while we aren’t home at least my house is clean). we woke up saturday morning and had to finish a load of laundry, then we had to finish cleaning the house, then we had to do some other things around the house (double check andy having his wallet) we put otis in his crate and we were on our way. we had grand plans of stopping for a nice breakfast on the way out of town. so we load up in the car and it is 10:20. oops so we left a little later. we ran by the post office, put gas in the car up, went to mcdonalds and got breakfast and continued down the road. we got our food and got on the road. traffic wasn’t too bad and the weather was nice. however, once i am in the car i get a little bored. 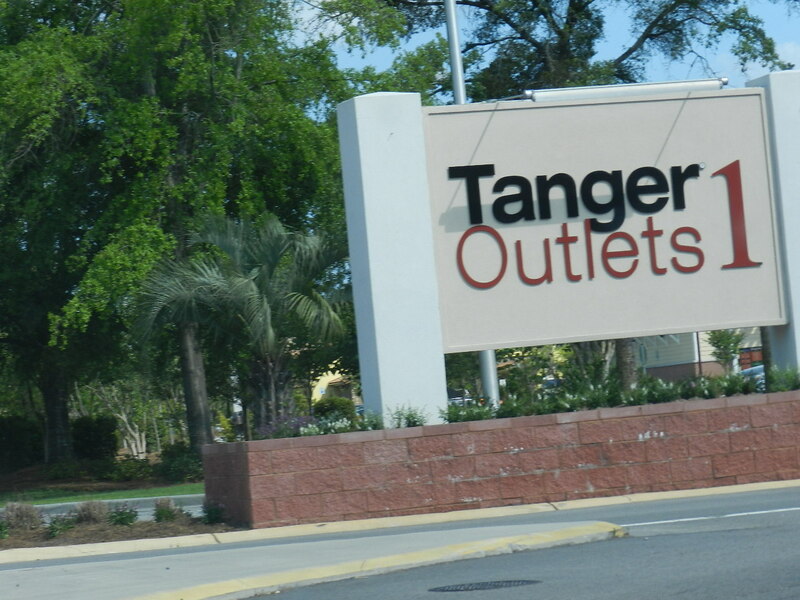 while we were driving down the road i saw a sign for tanger outlet mall. it was in hilton head so we made a little detour and went shopping. we got a few things (books i think) and got back on the road. it was good to make a pit stop and get out. we got back on course and made it to georgia. 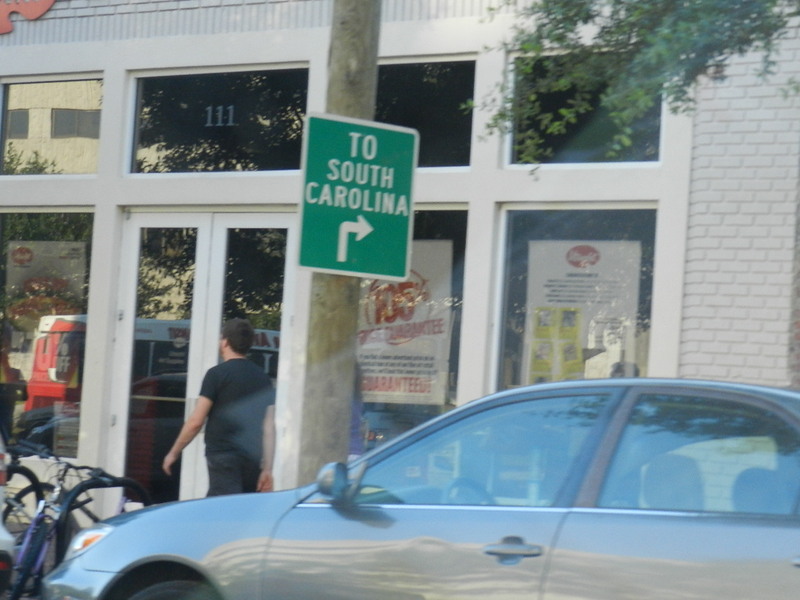 we decided to still drive through savannah even though it was later than we wanted it to be and since we weren’t hungry. we have both been to savannah but not together. it was fun to drive around and point out some things that we remembered. 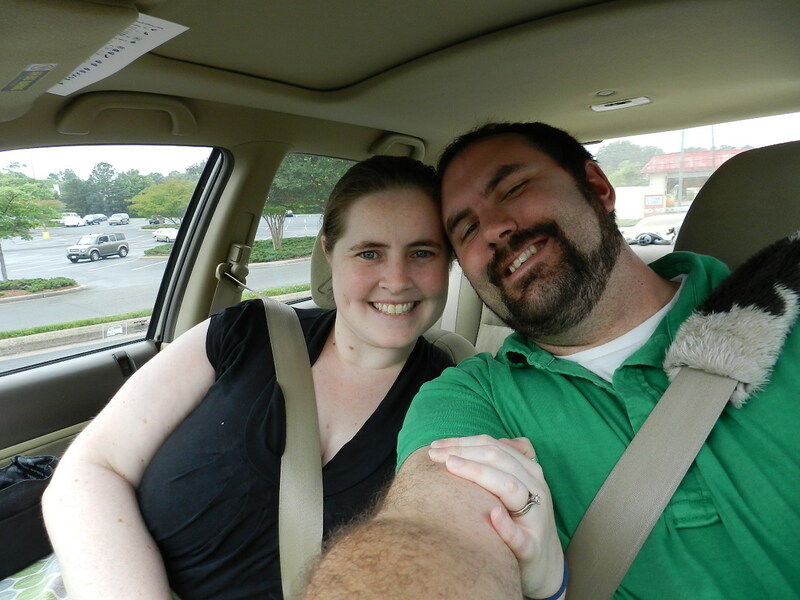 we talked about getting out and walking but there were a ton of people so we decided to stay in the car. we got to see several weddings in progress and stopped for a wedding party taking pictures in the road. we were ok waiting on them for a few minutes. i tried to get a good pic but couldn’t. we also saw a house i thought was so cool. it was covered in ivy (i think). but it just looked so cool. we left savannah and got back on the road. 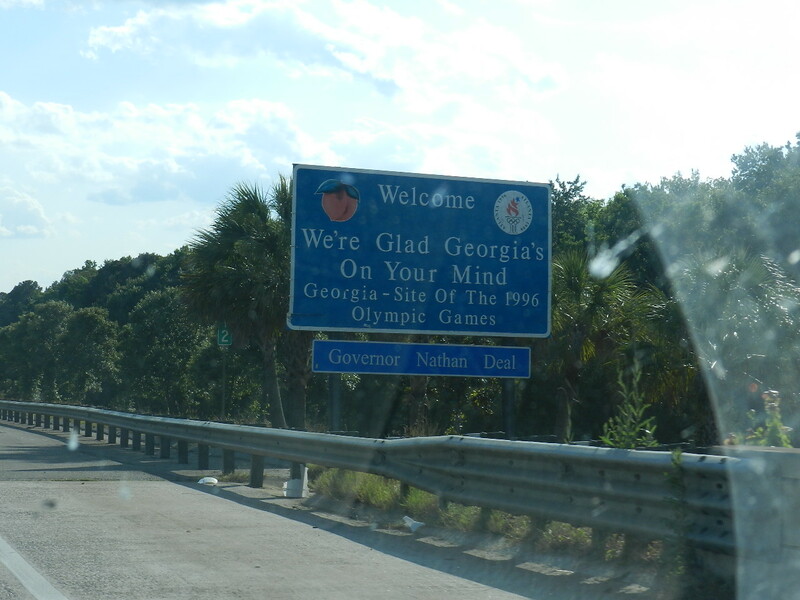 while we were getting back on the interstate we saw a sign and it made us laugh (glad i still had dad’s camera out so i got a pic). just random. we stopped for gas to top off (we wanted to make sure that we stayed pretty full just in case). but we decided to get burger king instead of going in so that we could keep going to orlando. while we were in the bk the cashier asked if we were going to prom….umm thanks but no thanks. we were in shorts and andy had a hat and we didn’t look like we were going to prom but anyways. before the sun set i got a great picture of the sunset. 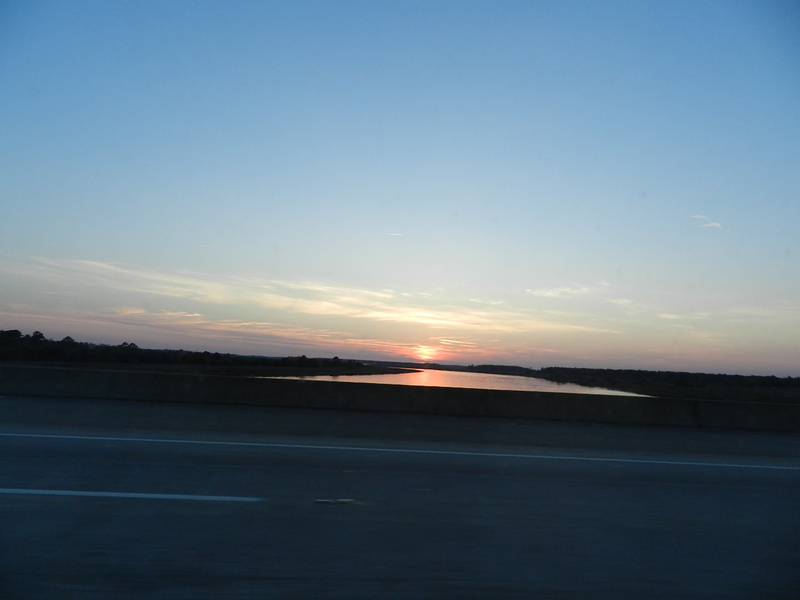 we crossed into fl and it was too dark to get pictures (since i didn’t know how to work the camera). i have several attempts at trying to get the moon (it was huge and orange). but no luck. 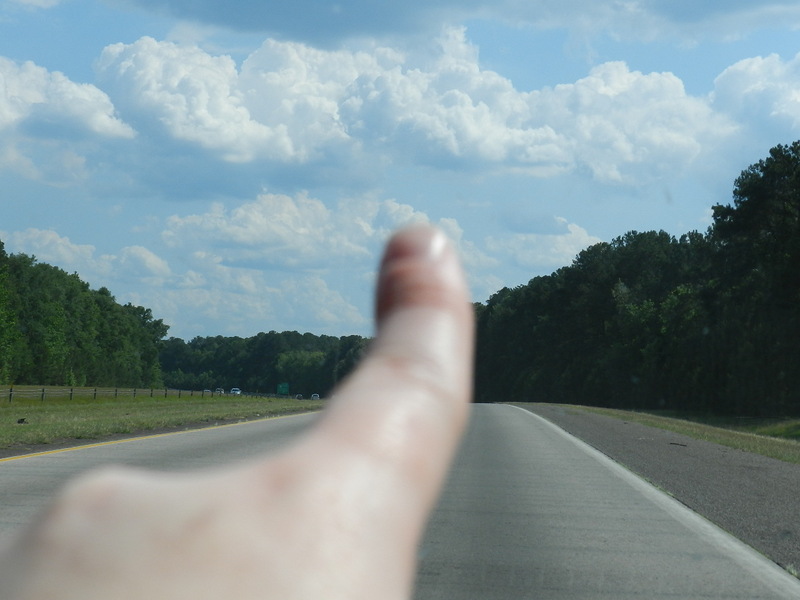 we drove and drove and took the orlando exit. we drove to find out hotel. we didn’t see it so we decided i read the directions wrong and we did a u-turn. we drove and drove and saw the sign for the comfort inn. we walked inside and said our names. he said we don’t have any reservations for you. luckily we had the reservation confirmation printed and with us. 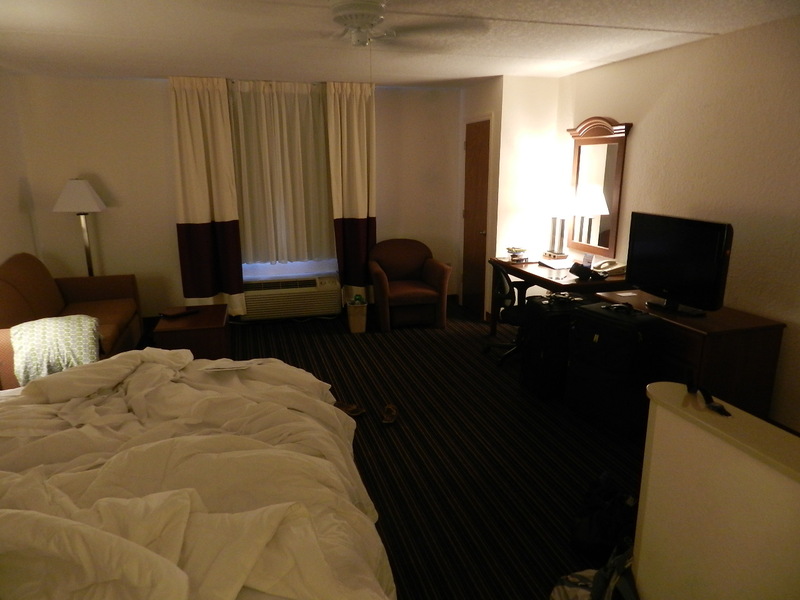 the guy told us we were at the wrong comfort inn (by this point it was late and i was tired and wanted to lay down so i almost started crying). the guy called the number on the reservation and we were going to right way the first time. luckily andy had his gps so we added the address and listened to the gps. it took us right where we had been before. we found our hotel…it didn’t have a sign next to the road….who doesn’t have a sign on the road? but we got checked in and went right to bed. 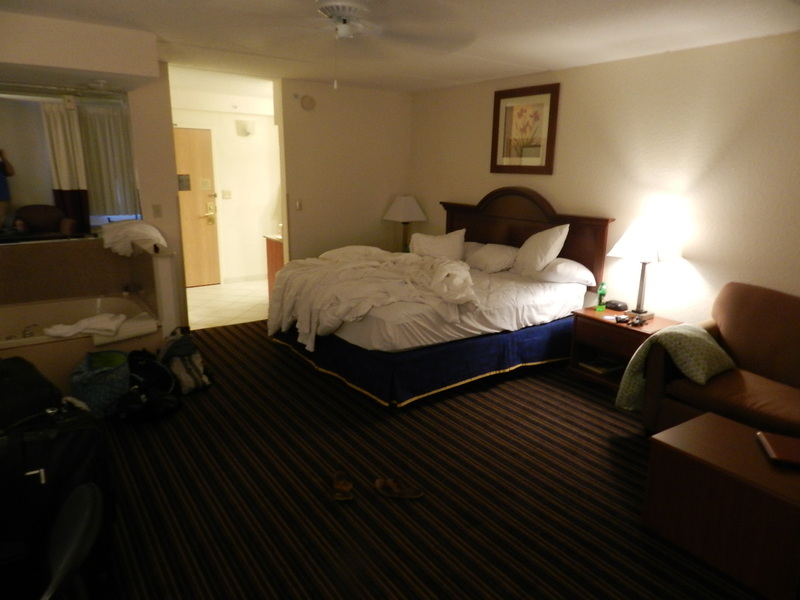 we had a huge bed and i got lost in it as soon as we walked in. we woke up the next morning got ready and went to breakfast at denny’s. it was packed. i was amazed at all the families and kids and old people and all the different nationalities. i am glad that we got there towards the end of the rush so by the time we finished we were almost alone. it was nice. we got in the car and turned on the gps (after the night before we decided we needed it for the rest of the trip). we drove towards seaworld. stay tuned for part 3: lots of sea creatures!